I still watch a lot more sunsets than sunrises but then I do not see that changing soon! And sometimes I do get to see sheer magic, as only nature can perform. 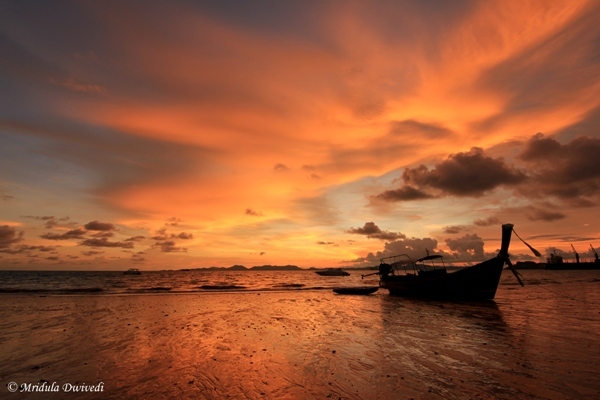 Krabi Skies in Thailand are beautiful any time of the day. It can become an enchantress at the sunset if it decides to do so! I start with this image of pool side at Phulay Bay which is a Ritz Carlton Reserve. Though not in the picture but a little away was the sea waiting for all the glorious colors that would start appearing in the sky in a little while! But as I was staying with Sofitel Krabi I spent a lot more time on Klong Muang Beach which is right across the road from the resort. 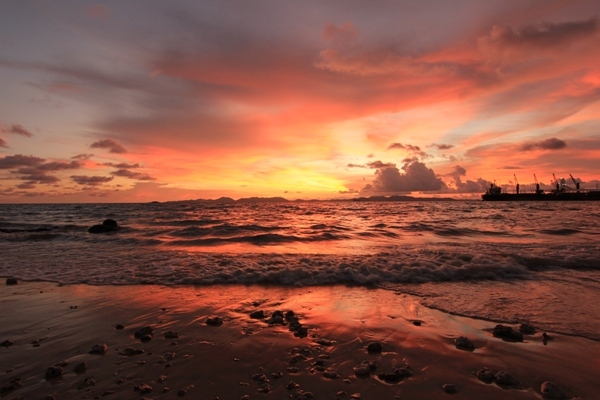 Of the two days that I spent at Krabi, only on one evening I had time to stand on the beach and watch the sunset. I click pictures more than . This was one of the tripod days. I have used a lot of zoom mounting the camera on the tripod to click this picture. Everyday when I can stand and gaze the setting sun, I wish for a little magic. But off late I got too many watery sunsets. 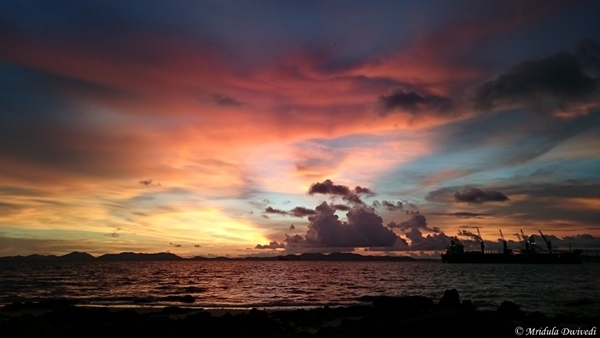 However, Krabi skies were kind to me, they went ablaze at sunset. There was a pier a little ahead which would have made for such a beautiful picture. 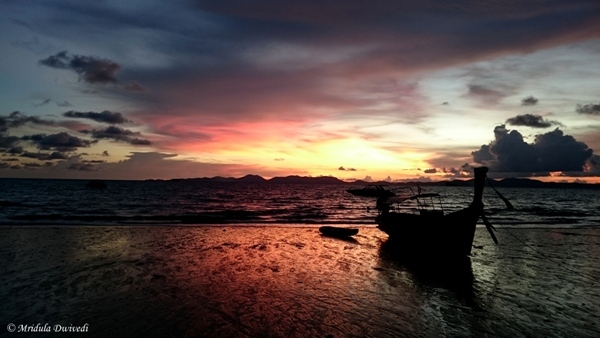 But I could not easily approach it from the beach and time was running out, I had to start from the hotel at 7.00 pm for dinner in the town Ao Nang. However, I lingered on till I can, after all who can walk away from such a sky, to click a few more pictures. The drama continued as the sun went down. There were many Sofitel guests on the beach and a few of them moved to where I was clicking pictures. One of them said remarked, “is it not a special one?” I entirely agreed with him that the sunset was indeed magical. I did not wish to leave the beach but I hate being late for appointments so with an effort I walked away from the sunset even though I knew, had I stayed it would continue to enthrall me for some more time! 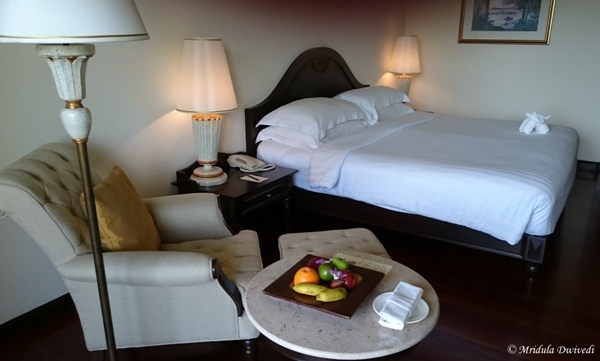 I stayed for two nights at Sofitel Krabi Phokeethra Golf and Spa Resort which I will call simply Sofitel Krabi in the post. 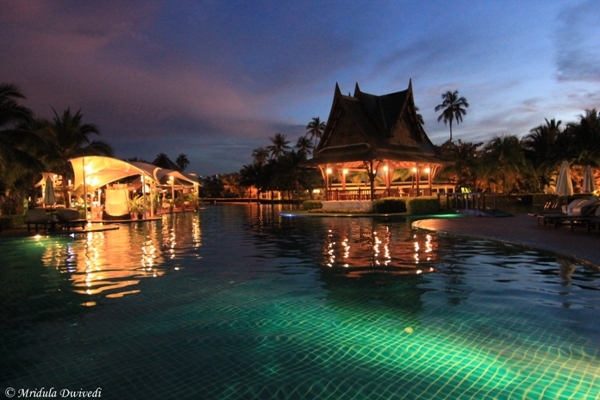 It is a beautiful property and has a magnificent swimming pool, a pool which is the biggest in Thailand. The architecture of the hotel is in colonial style. I had a lovely room at the third floor, the top story of the hotel. It was a pool facing room, which gave a peak of the ocean beyond. It was a large, spacious room with a work area and a cozy chair for reading or if you prefer watching TV. I would take the stairs to my room but there is a lift too in the extreme corner of the floor as well. The bathroom was luxurious too, with products from L’occitane for use. The bath tub was beautiful and deep. Everything was maintained well and I really had a comfortable time. The highlight of the hotel was the pool for me! I heard of it even before reaching there and I was so looking forward to swim. But my itinerary was such that I could find time to take a dip only once! It is a 700 meter pool and I have not made a typo. I knew I would didn’t had enough time to swim around it all but I surely wanted to walk around it. I could not even do that! The short swim that I managed was wonderful. It was a favorite hanging place for many guests. There were hammocks in the lawns around the pool and they too found a lot of takers. I used to take my breakfast at Maya and the spread used to be huge. I checked out a few things only from the buffet. My standard was fruit and juice followed by either pan cake or eggs. I liked their organic muesli too. One night I was so hungry I ordered a veg Pizza as there were not too many veg options on the room service menu. I do not what it was, whether I was so hungry or the pizza was so good or a combination of it, but I polished it off all alone! And it is a record of sorts! Their Spa is called So Spa in association with L’occitane but I could not try it out. They arrange various excursions for their guests on shared or private basis. I visited Hong Island with them on a private speed boat trip. It was so much fun and such luxury. Do click the link and check out the post on Hong Island too. They have a golf course too as the name suggests, but I only caught a glimpse of it while driving in and out of the resort! The beach is right across the road to Sofitel but it is a public beach. I loved it, I was lucky to see two amazing sunsets on it. But due the location, the hotel cannot have an exclusive beach. But I have a feeling that this is true of other hotels in the area as well. 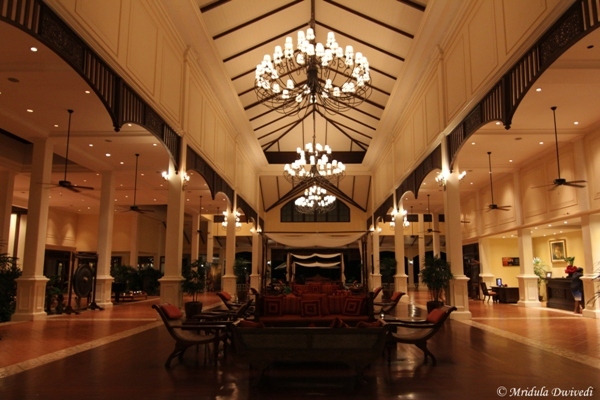 The lobby of Sofitel Krabi had a lively environment. Whenever I was coming or going, someone from the staff would say a kind word to me, or simply greet me. 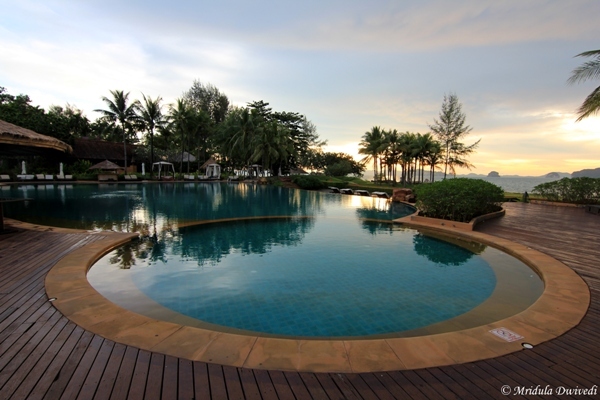 If you are looking for luxury in Krabi with a lively atmosphere, you will enjoy Sofitel Krabi. I had a truly lovely time with them. I was invited by TAT New Delhi to visit Thailand and I lived in such luxury on this trip! 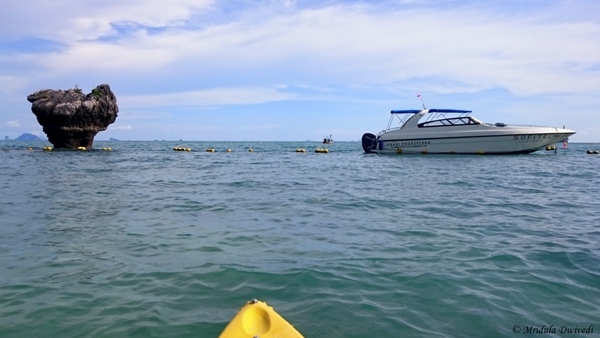 It is not every day that I have a luxury speed boat all to myself, well almost to myself! For accompanying me were 3 people, the driver of the speed boat, Salim and Nana, my beautiful host for the evening. 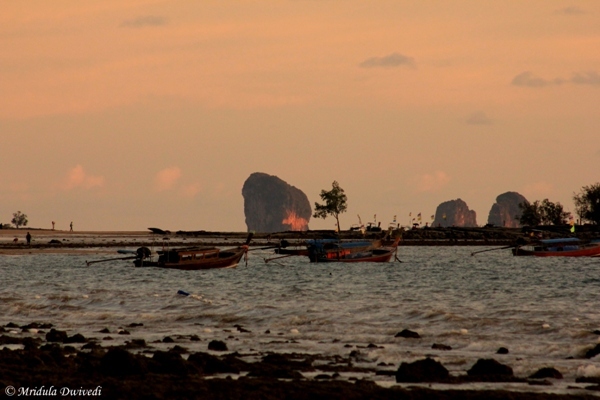 Our destination was the Hong Island, Krabi. 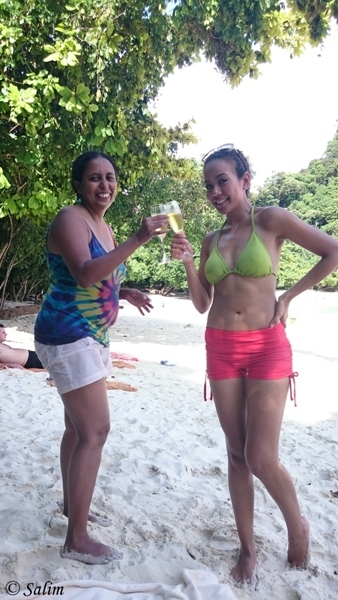 Sofitel Krabi had arranged this wonderful trip for me as a private excursion on their hotel speed boat. 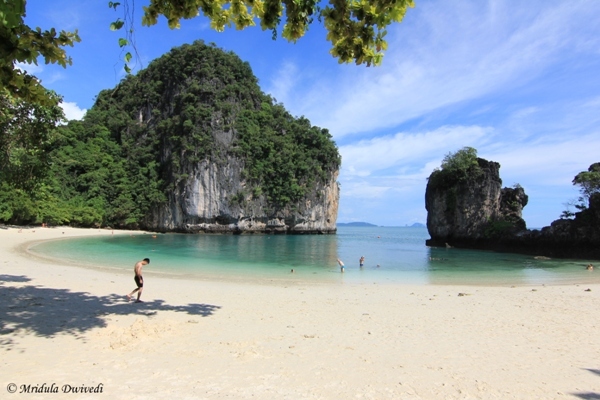 Hong Island is a popular hop over from Krabi, Thailand. The island is a 10 minute ride from the Sofitel Hotel. The beach is right across the road. 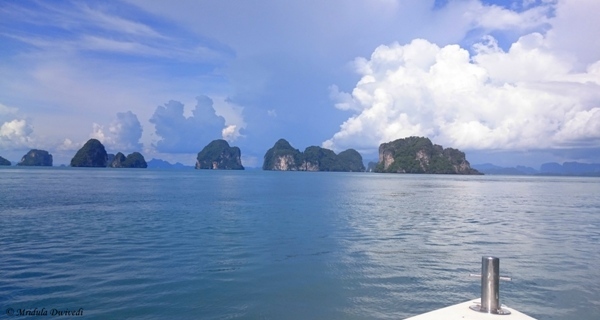 Long tail boats and shared speed boats are also available from various tour operators in Krabi. We started in the late afternoon and by now due to my earlier speed boat transfers I knew this was going to be a lot of fun. I always sat on the deck on all my speed boat rides and this was no exception. As a result, I don’t have a tan, I actually have a sun burnt face now! We were on the beautiful Hong Beach 10 minutes later. As it was late afternoon, the tourists were mostly going back. Nana told me that in high season the beach gets much more crowded. We tried to visit the lagoon but it was low tide so the speed boat could not enter it. But I did get a glimpse and it was beautiful. On the beach Nana revealed that they had sparkling wine for me as well! Now that was luxury! But before that I went snorkeling. The bay was peaceful and I could spot some colorful fish and coral as well. I sat down next to Nana after snorkeling and we indulged in some girl talk! Before coming to Sofitel, she was working in Bali! Then she asked if I wold like to go kayaking with Salim, her colleague. I was quite willing to do so. Salim told me to just do the photography and leave the paddling to him! I reluctantly agreed, after all he understood the conditions better. We did a short round and I was back to the beach. It was now time for some sparkling wine with canapes. It was the perfect end to a wonderful evening. 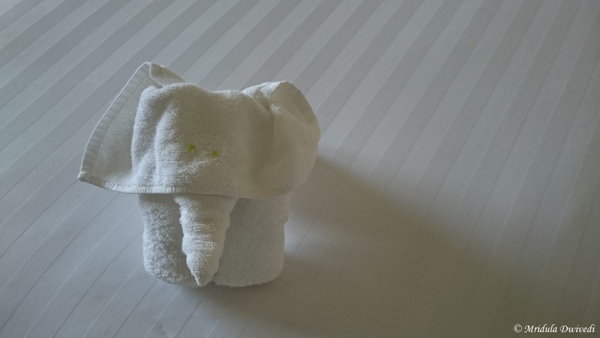 Many thanks to TAT New Delhi and Sofitel Krabi for offering me this incredible luxury! I was told that the cost of the private trip to Hong Island from Sofitel is 16,000 Baht.